Enjoy convenient access to the Orlando Convention Center, Port Canaveral and Orlando International Airport while staying at this newly renovated Orlando, Florida hotel. Whether traveling for business or for pleasure the Best Western Airport Inn and Suites has it all. Guests staying at this award-winning Orlando hotel will receive the highest quality of customer service and find unbeatable amenities for an affordable price. Guests will enjoy well-appointed guest rooms featuring cable satellite television, refrigerator, microwave and free high-speed Internet access. Start the day off right with a complimentary full breakfast and newspaper provided daily. After a long day, guests at this Orlando hotel are welcome to take a refreshing dip in the hotels outdoor swimming pool or rejuvenate with a workout in our fitness center. Guests traveling on business will also appreciate the variety of business services available on property including a business center. Located just minutes from the Orlando International Airport, the Best Western Airport Inn and Suites is the ideal lodging spot while visiting the Orlando area. Families especially will enjoy being conveniently situated to all of Orlandos famous attractions including Disney Springs , SeaWorld and Universal Studios . Cruise enthusiasts will love this Orlando hotels proximity to Port Canaveral. 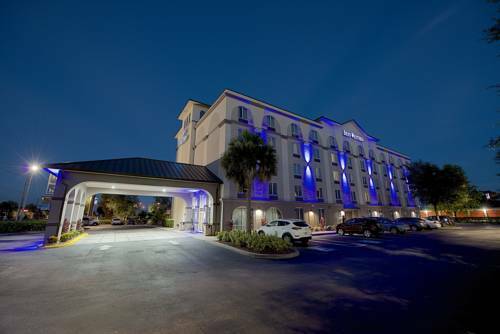 Nearby Chrysler Training Center and the Orlando Convention Center makes conducting business from the Best Western hotel in Orlando easy and convenient. Our friendly, helpful multi-lingual staff at the award winning Best Western Airport Inn and Suites is ready to ensure a comfortable and memorable stay in Orlando, Florida. Make a reservation today and save. Enjoy your stay. From: Interstate 4. Take Exit 28/528 east to Exit eight. Turn left at the stop sign and left again at the traffic light. The Best Western Airport Inn and Suites is located one mile on the left. From: Orlando International Air Take Highway 436 north to the Beeline Highway 528 West. Take Exit eight, which is McCoy Road and drive one-fourth of a mile. The Best Western Airport Inn and Suites is located on the left.